When you see the Moon way up in the sky, it’s hard to get a sense of perspective about how big the Moon really is. Just how big is the Moon compared to Earth? Let’s take a look at the diameter first. The diameter of the Moon is 3,474 km. Now, let’s compare this to the Earth. The diameter of the Earth is 12,742 km. This means that the Moon is approximately 27% the size of the Earth. What about surface area? The surface area of the Moon is 37.9 million square kilometers. That sounds like a lot, but it’s actually smaller than the continent of Asia, which is only 44.4 million square km. 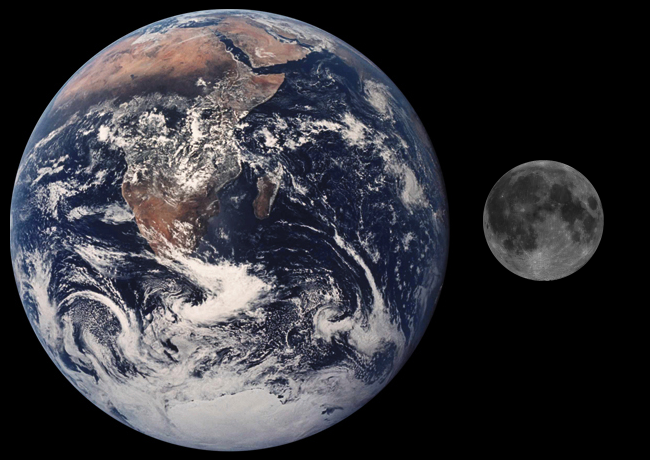 The surface ares of the whole Earth is 510 million square km, so the area of the Moon compared to Earth is only 7.4%. How about volume? The volume of the Moon is 21.9 billion cubic km. Again, that sounds like a huge number, but the volume of the Earth is more like 1 trillion cubic kilometers. So the volume of the Moon is only 2% compared to the volume of the Earth. Finally, let’s take a look at mass. The mass of the Moon is 7.347 x 1022 kg. But the Earth is much more massive. The mass of the Earth is 5.97x 1024 kg. This means that the mass of the Moon is only 1.2% of the mass of the Earth. You would need 81 objects with the mass of the Moon to match the mass of the Earth. We have written many stories about the Moon on Universe Today. Here’s an article about heavy construction on the Moon, and here’s what it would take to build a moon base. Want more information on the Moon? Here’s a link to NASA’s Lunar and Planetary Science page, and here’s NASA’s Solar System Exploration Guide for the Moon.